Well-designed and constructed fences are essential infrastructure on any property. Without quality fencing, maintaining livestock can be a real headache. Straying stock are not only a danger to themselves and passing motorists but also a sure-fire way to get the neighbours offside. Luckily, smart investment in the right fencing material and a little fencing know-how can go a long way to managing both four and two-legged creatures. Landholders have a legal obligation to fence their property. Local government authorities (LGA) can provide some basic guidelines and minimum fencing requirements. Generally, the cost of a boundary fence between private land is shared equally between both parties. Boundary fences between private land and the Crown are the responsibility of the landholder. Whether replacing an existing fence or erecting a new one the first step is to decide on the most appropriate fence for the job. Fences can be divided into two broad categories — conventional and electric. Conventional fences use prefabricated rolls, plain wires or barbed wire to create a physical stock proof barrier. Electric fences rely on a psychological barrier created by an electric shock to prevent stock crossing the fence. The type of animal needing to be kept in or out - different animals have different fencing requirements. Cattle for instance place much higher pressures on fences than sheep. Whether the fence is an internal fence or boundary fence - boundary fences may need to be sturdier than internal fences. Barbed wire may be recommended for boundary fences. The topography of the site - does the fence pass through gullies or up steep slopes and other issues such as whether the fence will have to withstand floods or fire. 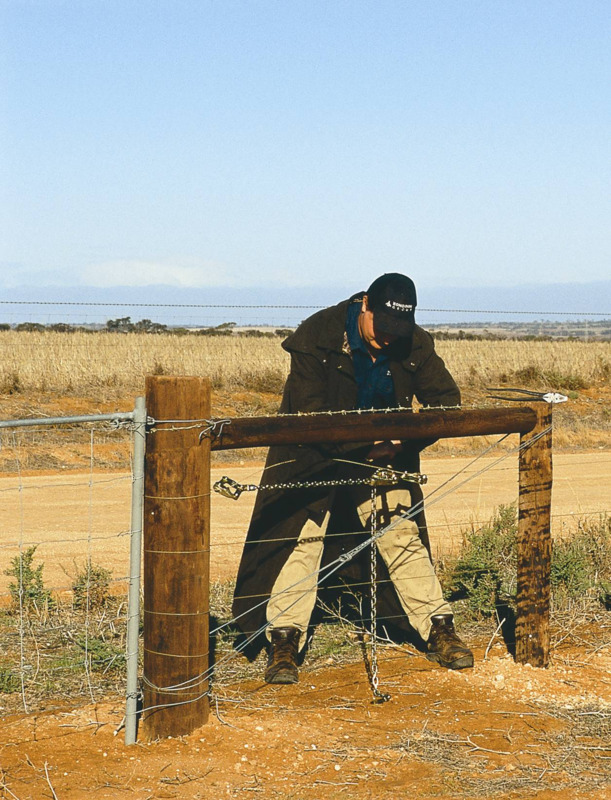 Other landholders and local fencing suppliers can help determine the most suitable fence for your application. droppers and wire stretched tight between the strainers. Strainer assemblies are the most important part of any fence. Their job is to transfer the tension in the wires to the ground. There are two main strainer assembly designs - the diagonal stay and the box. Diagonal stay assembly. These figures are only a guide, post size may vary. Box assembly. These figures are only a guide, post size may vary. Intermediate posts perform two functions; to guide the line wires off the ground at the correct spacings and, to some extent, provide lateral resistance to pressure by transferring it into the ground. Droppers, which are suspended in the fence, maintain the vertical wire spacing and spread any lateral pressure onto all the wires. Three main types of wire are used in fencing; prefabricated rolls, plain wire and barbed wire. The most expensive - prefabricated rolls - are a quick and easy way to erect a fence. They can be used in conjunction with plain or barbed wire. Wire comes in many thicknesses (gauges) and tensile strengths. A fencing material supplier can help you decide what is the most appropriate gauge for your fence. End assemblies can be built from steel, concrete or timber (treated or natural). Treated timber is a popular choice because of its resistance to termites. It is light and can easily be cut to length in the field. Steel is more expensive but is an excellent alternative in high fire risk areas. Steel posts can be installed quickly by hand without the need for a tractor and can be galvanised to prevent rusting. Concrete posts need to be prestressed to perform well but they can still be affected by fire and are very heavy.